I’m delighted to announce that all the new speed test tutorials are now in Level 4 of the Webmaster Training courses! Besides the new WebPage Test and GTMetrix series, there’s also a new one on Chrome Dev Tools. The more I use that thing, the more I like it. And it’s great for helping chase down mixed media issues with HTTPS conversions too. As all the folks in both of my member sites can confirm, I’ve been applying new Cloudflare speed and security tweaks to BlogAid. And they work great on BlogAid, just as they did on my test sites. But, didn’t work so well on my member sites. Since the member sites are sub domains of BlogAid, any setting I have for it on Cloudflare affects the member sites too. And it was weird goofy, random stuff that wasn’t happening for everyone. I eventually had to back all that out and even recreate the permalinks for tutorials released while those tweaks were live so that they were fully cleared. I’d love to be able to troubleshoot it further, but I couldn’t even replicate the problem consistently. And of course, I can’t goof with access to paid tutorials on purpose either. So, my apologies to all members and I appreciate your patience and understanding with this. I take it very seriously that this has disrupted your schedule for seeing replays of live Workshops, or accessing other tutorials you needed for your work. I’m ready to do aggressive tweaks directly on the live BlogAid site now. And none of these will affect the member sites. Just warning you because you may see odd things on BlogAid as I try these super aggressive settings. This week I’ll also be contacting some of my site audit clients who volunteered for aggressive speed tweaks on their sites too. I have 3 different site types picked out, because each will have a different mix of settings due to different restrictions. For instance, folks who run ads on their sites can’t use a few of the speed tweaks at all, and others need to have exclusions for the ads. And this will also give me an opportunity to test with a wider range of plugins, to see if any of them are negatively impacted by the tweaks too. On top of it, I’ll be doing deep audits for page weight, so we can see what it will take to lighten the load before we apply tweaks, and then how well those tweaks work on what’s left. So, lots of testing and documentation still to do, but I’m beyond grateful to be doing it on real sites and not just testing sites anymore. It’s like the difference in theoretical physics and applied physics. It’s always fun to build real things and see how they hold up in the real world. I knew I would soon be getting a waiting list for site audit and HTTPS requests. But I honestly didn’t think it would hit until next month. I’m already booked into mid April at this point due to some of the current projects being so big. These are folks who have been blogging for 10 years and have moved to lots of different hosts, which left all manner of orphaned and conflicting directives behind. And they’ve tried and deleted all manner of plugins, which have also left orphaned files, folders, and database tables behind. Or, they have conflicting plugins, or a mismatch of security directives and such. So, lots and lots to clean out and then secure and then make fast. Google’s deadline for HTTPS and speed is July. So, if you’re thinking about having these services done, get on my list today!! I’m holding off updating to Yoast SEO 7.0.3 until I have a chance to check it on a test site later this week. I believe most all of the bugs have been worked out, but I want to double-check the XML sitemap. I heard a rumor about it being affected. Have you updated this plugin yet? Let us know in the comments, or anywhere you see this post online. Woohoo! The folks at Let’s Encrypt have finally released their much anticipated free wildcard SSL certificate. This will allow you to cover a multitude of domains, instead of just one. But, if you’re using Cloudflare and have sub-domains it still won’t cover those. You’ll still need a paid cert at Cloudflare to cover the 3rd tier domains, such as the www version of the sub-domains. That’s even if your canonical is not www. You need it for the proper redirect. SiteGround has changed when auto updates occur for WordPress, so you’ll have more time to prepare, if needed. Here’s a link to their auto updates tutorial, if you want to make changes. This is a must-read post from Yoast, especially for those who heavily promote their blog categories. This affects archive pages, which includes blog, category, author, and other such archive pages. And it makes me wonder if some of those messages a few of you have been getting from Google are related to this. UPDATE: I got the answer to this and made a video tutorial for you on How to Delete Old XML Sitemaps in Google Search Console. And speaking of notification emails from Google Search Console, I had a fresh thought on that. When we converted our sites to HTTPS, we verified both versions of the new properties at Search Console, meaning the www and non www versions of HTTPS. And then we submitted our new XML sitemaps to the new canonical. But, we didn’t touch the original XML sitemap on the original canonical HTTP version. As more of my webmasters and DIY SEO members and site audit clients have been reporting in our Facebook groups about the notices from Search Console, many of them are for super old posts or categories that no longer even exist. So, that got me to thinking about those old XML sitemaps that are no longer being updated. I asked about it on the Google Webmaster Central forum. They verified that we should only submit the new XML sitemap to the new canonical which is what we’ve been doing. I’ve followed that up by asking if we should also delete the old one on the original canonical. For folks who run image heavy sites and that’s your big draw, you’ll definitely be happy about this quiet little move by Google last week. In image search, there is no longer a View button where you can click and see just the image out of context. Now there is a Visit button, which takes you to the site the image is on. This could mean a LOT more traffic to your site if your images rank well. Keep in mind that Google indexes a whole bunch of stuff about your images. And that’s just one of the things we covered in our recent DIY SEO workshop too. And, Google has made another change to image search that you’re going to like. The images now have a caption on them. It’s your post or page title. To be clear, that’s the Title of the post. It is not the title attribute of the image. Ensure you make that distinction anywhere you see news about this. I’ve already seen a lot of confusion about it in blogger groups. I want to thank Amy Lynn Andrews for her super tips about this in her Useletter. If you’re a blogger, this is definitely something you should subscribe to. And it’s different from her blog posts too. 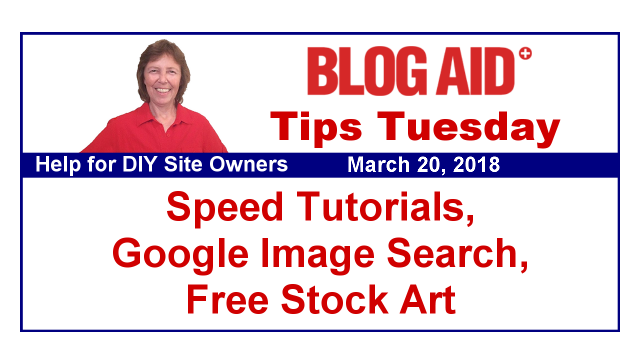 In the past few Tips Tuesdays, I’ve linked to good places to get free stock images. Well, what about some great stock art, including wonderful illustrations? This post from Creative Bloq has several good places to get stock art. The whole top half of the list is for paid services, but the bottom half has free stock art sources. Just be sure you read and follow the Terms of Service for each one!! I really like this post on WPTavern about the new milestone that WordPress just hit. They give all the numbers in context. WordPress now powers 30% of the top 10 million sites for traffic, where the CMS, or Content Management System is known. That’s a 60.2% market share, which is very impressive. So, what counts as a site? Sub-domains count as one site. So, even though WordPress powers 4 BlogAid related sites, it only counts as 1 site because the other 3 are sub-domains. WP.com and other sites hosted by Automattic count, but only if they have significant enough traffic to be in the top 10 million sites as rated by Alexa. So, WordPress powers a lot more sites than what they are counting. The article goes on to say that there are about 2 billion sites on the web, but the majority of them are abandoned. And I bet the majority of them are either on WP.com or other free hosting, like Blogger and such. The one thing I will say about that is thank goodness the security and updates are taken care of for them, else we’d have a ton more hacker issues than we already do. Woohoo!! One of the ways Cloudflare makes delivery of your site so fast is to deliver it from down the street. This really cuts down on latency of running through so many internet wires and hubs that are between where the host files are located in a server farm, and where the site visitor is located. Cloudflare already had 25 U.S. locations and now they have just added 5 more. And pretty soon, they will be delivering from cell-towers due to the impending 5G connections that are coming. Torque has an excellent post about the trends sites are taking this year and beyond. It’s a must-read for all designers. One page websites – I understand why some folks would want this, but I think it leaves too skinny of an online footprint. The decline of Flash – honestly, if you still have any of this on your sites, you’re way behind! I’ve got an old video player on the now defunct WP tutorials site that requires Flash. It’s one more reason why I’ll be killing off that member site later this year. Mobile-first design – Google now considers the mobile version of your site as your primary. I believe all of us should start thinking that way too. And it’s one more reason I’m doing a theme revamp on BlogAid. Push Notifications – I’m seeing these more and more now. Folks want a blip on their phone when you have a new post instead of it landing in their email inbox. The caveat is, you need to be super careful which service you use for this. You may not have access to the email list, or not have styling options or such. Modular Page Creation – this is huge because this is what Gutenberg Blocks are all about. And I believe it is preparing the way for what I call Web 3.0, where intended layout will take a backseat forever. Site visitors will tell the browser, or whatever thing is used to view the site, that they always want the navigation in a certain place, content in a certain place, and so on. Someday soon we will be using Virtual Reality to view sites. It won’t be anything like the way we do it on a device’s screen now. Progressive Web Apps – I can see big brands continuing to develop their own apps. But I don’t see this as a trend for most of us bloggers. Interesting tidbit about Google images-another great post! I’m so glad we covered this in the DIY SEO course. Big boom for folks with great images.